​Within the economic domain, the Classic to Postclassic transition is characterized by major changes in subsistence systems as well as production and distribution systems of luxury and utilitarian goods. There was a major shift in the subsistence economy from an agriculturally based food production strategy in the Late Classic to extensive exploitation of marine food resources in the Terminal Classic Period, then diversification in the Postclassic Period. Production and distribution of ceramic and lithic goods shift from smaller-scale regional networks of the Classic Period toward participation in an increasingly integrated and commercialized economic system in the Postclassic Period. These dynamics were part of broader pan-Mesoamerican transformations towards increasing internationalism and economic integration. 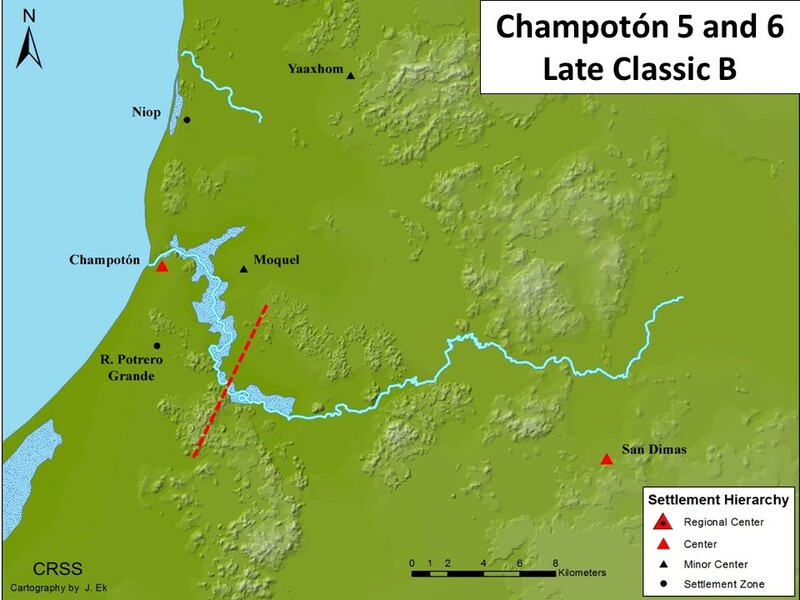 The economic link between Champotón and Edzná outlined in the discussion of political dynamics were part of a strategy to inland-coastal trade routes. Edzná control over centers in the mid and upper reaches of the Río Champotón (Ulumal and San Dimas) would have facilitated access to the Gulf Coast via the Río Champotón and the extensive system of canals through the Edzná Valley. Yet production and distribution of most goods was regional in scale during this period, reflecting localized production and distribution of most utilitarian items - including ceramics and lithics - and procurement of obsidian from the highland Guatemalan source of El Chayal. There was a gradual transition from a regional economic system focused on local production of most utilitarian goods and limited bounded exchange along the Río Champotón to a more integrated economy based on high-volume coastal exchange. The transition to a more diversified and integrated economy based on interregional and long-distance exchange – as reflected in lithic and obsidian production and distribution systems – was a much more gradual transition that was not fully realized until the Postclassic period. Changing dynamics in the economic domain during the Late Postclassic were characterized by increasing economic integration. Regional economies become more diversified, with increasing quantities of goods procured through trade. Late Postclassic exchange systems were less bounded than in the previous period, with the administered exchange of the Middle Postclassic giving way to a much more open and commercialized economy. The increased diversity of trade goods is most clearly reflected in the chipped stone assemblage, with both CCS and obsidian goods procured from a greater diversity of source areas. Ethnohistoric source for this period provide additional information about the centrality of exchange, complementing the archaeological data. Multiple sources of information reflect participation in the highly integrated and international exchange systems of the Postclassic Period. ​The Late Postclassic ceramic assemblage is very similar to the preceding period. The serving vessel subassemblage of the Champotón 7 complex is dominated by imported fine paste ceramics. As in Champotón 7A, the vast majority of these materials pertain to a single group: Matillas Fine Orange. This ware makes up 15-20% of the Champotón 7 ceramic repertoire, indicating procurement of a large volume of ceramic vessels via coastal trade from Tabasco. One of the more interesting aspects of the Champotón 7 complex is the extreme rarity of red slipped serving vessels that are a consistent component of the ceramic repertoire in contemporary complexes from other parts of the Maya Area. At Champotón, it seems that fine paste vessels functioned as the dominant serving vessel. This imported ware has a relatively even distribution among urban and rural settlements, as well as elaborate and modest households, indicating widespread access within the region. As Matillas Fine Orange occurs in lower frequencies across the Yucatan Peninsula during this period, it is possible that Champotón played some role in facilitating exchange between the Chontalpa region and markets further to the east. 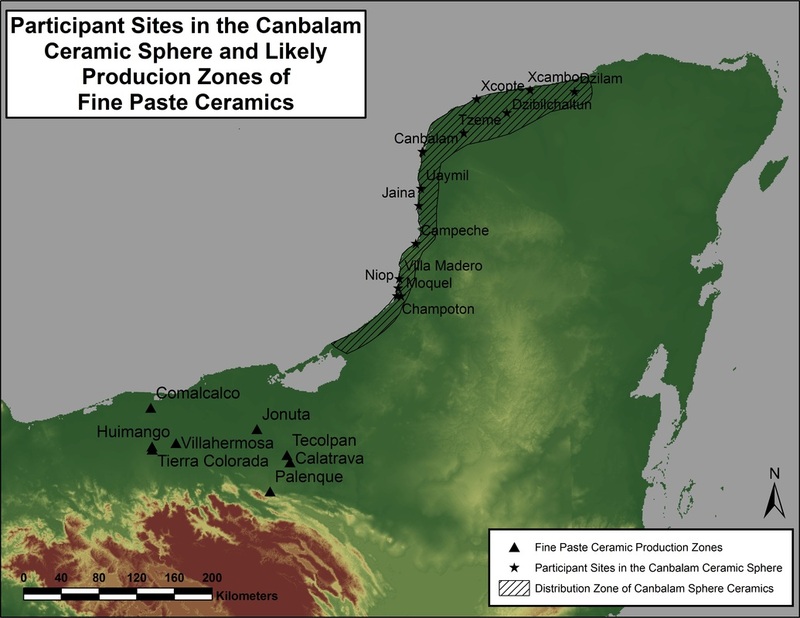 Locally produced types in the Champotón 7 complex demonstrate strong modal similarities with contemporary pottery from other major Postclassic centers in the Maya Lowland, including Mayapán (Smith 1971), Lamanai (Aimers 2009; Graham 2001; Graham 2004), and Santa Rita (Chase 1986; Chase and Chase 1988). The form repertoires and decorative motifs of Matillas Fine Orange and Postclassic redwares such as Mama Red exhibit strong similarities, reflecting the production of local analogs in distinct wares. As Aimers (2009) has shown, broad commonalities in decorative modes shared by Postclassic polities indicate a relatively high degree of integration. The chipped stone tool assemblage reflects two processes of change in the Late Postclassic regional economy. The first is a notable increase in the volume of goods entering the Río Champotón drainage from outside the region. Patterns in lithic debitage provide very little evidence for local production of CCS tools. The frequencies of early stage reduction debitage, post-production debitage, and aggregate debitage densities are consistent with importer communities. The quantity and widespread distribution of obsidian in the region also reaches maximal levels, indicating relatively unimpeded access to this long-distance trade good. This highly integrated economy contrasts with earlier periods. During the Classic Period, chipped stone tool industries where characterized by a nested system of local, regional, and interregional exchange. By the Postclassic Period, this regional system appears to have changed, with little evidence of local production of lithic tools in any of the communities tested by this project. As in the preceding period, lithic tools were procured by exchange with communities outside the region. The second trend in the Postclassic lithic economy is a radical increase in the source diversity of goods entering the region. The Late Postclassic lithic assemblage is dominated by a diverse mix of chalcedony and very fine grained cherts. Chalcedony becomes particularly common in the urban center of Champotón, making up 70% of the Late Postclassic assemblage. Very fine grained cherts are also common, with a very wide range of variability in color and texture. Although it is currently not possible to trace these materials to specific sources, the variability in raw materials is in marked contrast to earlier periods, and clearly reflects access to lithic goods from diverse sources. High frequencies of chalcedony have also been identified in the lithic assemblage at Mayapan (Braswell 2010), and could have been procured through the same lithic exchange system. These data are consistent with a shift from a mixed system of nested local, regional, and interregional production and distribution systems towards procurement of most goods through interregional exchange. The same patterns are also reflected in obsidian artifacts. Across the region aggregate densities of obsidian reached their highest levels, with all sites having relatively abundant access to this imported commodity. As in the preceding period, Ixtepeque continued to eclipse Chayal as the dominant source of Guatemalan obsidian. The most notable change between the Middle and Late Postclassic is in the diversity of source materials entering the region. Mexican obsidian became a notable component of the obsidian assemblage for the first time during the Late Postclassic, with small quantities of blades from Pachuca, Paredon, Pico de Orizaba, Ucareo, and Zaragoza. This pattern is most distinctive at Champotón, which has seven sources represented. These data reflect incorporation into Late Postclassic obsidian exchange spheres (Braswell 2003), with source frequency distributions similar to the diverse assemblages of Central Mexico (for a useful summary of regional patterns, see Smith, et al. 2007). However, access to obsidian from Mexican sources appears to be restricted to urban consumers. While communities such as Paraiso, Niop, and Kaymuch had access to similar quantities of obsidian as epicentral Champotón, the vast majority of these goods were from Guatemalan sources. These data could indicate separate exchange networks for Mexican and Guatemalan goods. In aggregate, obsidian source distributions – with a predominance of Ixtepeque and Chayal as well as multiple Mexican sources – is remarkably similar to that documented at the contemporary city of Mayapan, reflecting participation in the same Late Postclassic Southeast Maya Sphere (Braswell 2003; Braswell 2010). Ethnohistoric sources provide supplemental information about Late Postclassic economic systems. Spanish accounts of the ancient port city describe a fleet of over 2,000 canoes, reflecting the importance of the Gulf Coast as a major transportation route (Oviedo y Valdes 1853:Vol III, pg 244; Roys 1957:168). ​​From these data we can deduce that the initial changes in the region were driven by political dynamics and changes in the subsistence economy, with subsequent development of more integrated economic systems during ensuing periods. The gradual nature of this process suggests that reorganization of long-distance trade networks was not a catalyst of change in the Late and Terminal Classic, but instead more likely represents an aftermath of the collapse of societies in the CLM, movement of populations to coastal locations, and the resulting power vacuum of the decline of hegemonic political networks. Champotón was one of several port cities connecting Central Mexico and the Maya Area, including trade entrepôts such as Xicalango and Potonchan (Scholes and Roys 1968; Vargas 1982; Vargas 1985; Vargas 1994; Vargas 1997; Vargas 1998). Participation in this coastal trade network is well documented in sources such as the Papers of Paxbolom Maldonado, which describes an attack on Acalan by both Chakanputun and Potonchan in response to the latter’s interference in canoe traffic (Scholes and Roys 1968:72). This account provides a unique window into interactions between international trade centers in maintaining active trade along this important route. 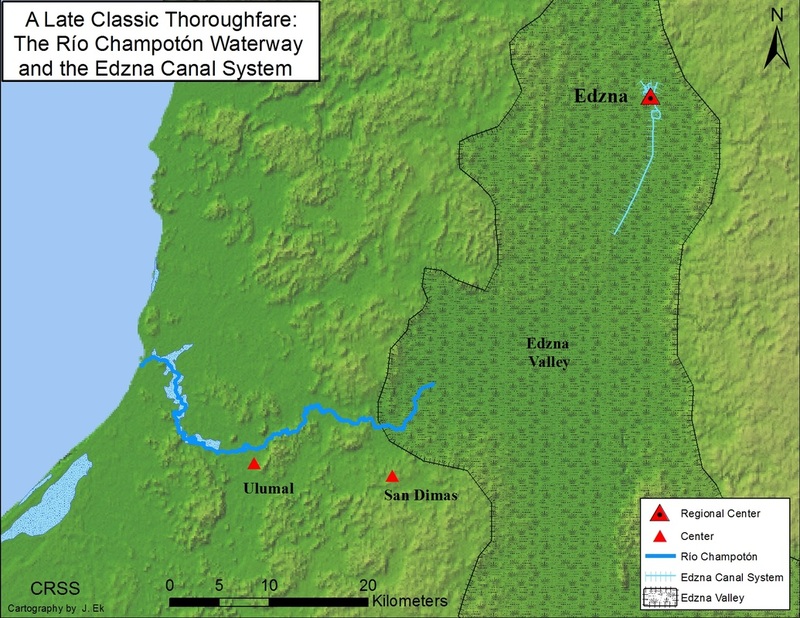 Late Classic communication routes between Late Classic centers in the Río Champotón drainage and the regional polity of Edzná. Ulumal and San Dimas were connected to the Gulf Coast via the Río Champotón, while a canal extending south of Edzná would have connected the latter city with the headwaters of the Río Champotón in the Edzná Valley. Formation of a new regional territorial boundary within the Río Champotón at the end of the Late Classic Period. With the decline of Edzna as a regional power, regional populations shifted to the coastal margin. The center of Ulumal fell into decline while San Dimas forged political links with the Chenes region.